Savannah, the largest city and the commercial metropolis of Georgia, capital of Chatham co., on the right bank of the Savannah river, 18 m. from its mouth, and at the terminus of the Central, Atlantic, and Gulf, and the Savannah and Charleston railroads, 82 m. in a direct line and 104 m. by rail S. W. of Charleston, S. C.; lat. 32° 5' N, Ion. 81° 5' W.; pop. in 1850, 15,312; in 1860, 22,292; in 1870, 28,235, of whom 13,068 were colored and 3,671 foreigners. 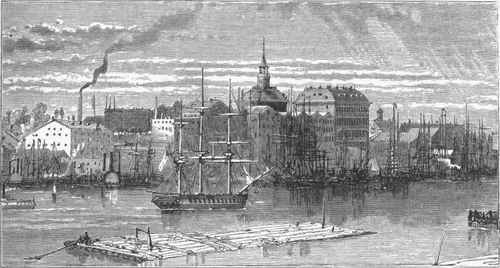 The city is on a sandy plain about 40 ft. above the river, with one narrow street below the steep bluff, the warehouses upon which open below on the level of the piers, and from the uppermost story on the other side upon a wide sandy area called Bay street, which is divided by numerous carriageways and rows of trees. The whole city is regularly laid out with broad shaded streets, and at many of the principal crossings are open squares with trees. The corporate limits extend about 1 1/2 m. back from the river, and include an area of 3 1/3 sq. m. The water front extends in the form of an elongated crescent about 2 1/2 m. Suburban settlements are fast springing up S. of the city limits. In this district a public park of 30 acres, called Forsyth place, has been laid out. Bonaventure cemetery, about 4 m. from the city, is reached by a fine drive. The principal other cemetery is Laurel Grove, belonging to the municipality. The residences are mostly surrounded with flower gardens, which bloom all the year. The most noticeable public edifices are the city exchange, court house, state arsenal, barracks, artillery armory, theatre, St. Andrew's hall, lyceum, Oglethorpe hall, Chatham academy, custom house, market house, hospitals, and asylums. The custom house is of granite, 110 ft. long, 52 ft. deep, and 52 ft. high, and contains also the post office and United States court rooms. St. John's and Christ churches (Episcopal) are respectively Gothic and Ionic edifices. Several other churches are very handsome and commodious, among which is the independent Preshyterian church, of granite, costing about $130,000. The Georgia historical society has a large and beautiful hall. The reservoir is on a circular tower 80 ft. high; new pumping works have recently been erected. There is a monument to Gen. Greene in Johnson square, and one to the memory of Pulaski in Monterey square, on the spot where he fell in the attack on the city in 1779. The harbor is one of the best on the southern coast. The depth of water on the bar is 19 ft. at mean low water, and 26 ft. at mean high water; within, at the Tybee roads anchorage, the depth is 31 ft. and 38 ft. respectively. Only 12 ft., however, at mean low water and 18 ft. at mean high water can be carried up to the city, and much dredging is required to keep the channel open in certain places to this extent. The river flows between marshy lands, which are intersected by numerous creeks and artificial channels, and are cultivated chiefly for rice. Long narrow islands and spits almost level with the water occupy a large portion of the space between the opposite banks, and reduce the main channel for a considerable part of the way between the city and the mouth to a width of a quarter of a mile and even less. From the city to Hutchinson's island, which extends about 6 m., is only about 600 ft. The chief defences of the river are Fort Pulaski, a strong fortification on Cockspur island, at the mouth of the river, built by the United States at a cost of $988,859, and Fort Jackson on the right bank, 4 m. below the city, built at a cost of $182,000. Steamers run regularly up the river to Augusta, and to New York, Boston, Philadelphia, Florida, and southern ports. - The chief business of Savannah is the receipt and shipment of cotton, though the trade in lumber is also considerable. Entire value of exports to foreign ports. The value of imports from foreign countries in 1874 was $788,220; of exports to coastwise ports, $18,076,451; of all exports, $50,500,946; tonnage entered in the foreign trade 237,619, cleared 189,399; entered in the coastwise trade 342,673, cleared 377,459. The number of vessels belonging to the port on June 30, 1874, was 80, with an aggregate tonnage of 22,170. The chief manufacturing establishments are several planing mills, founderies, and flouring and grist mills. There are a national bank, with a capital of $750,000; three state banks, with an aggregate capital of $9,000,000; and several building and loan associations. - The city is governed by a mayor and 12 aldermen, elected biennially. It has a good police force and an efficient fire department with a fire-alarm telegraph. The amount of taxable real estate and improvements is about $14,000,000. The receipts into the city treasury during 1874 were $988,320 65, of which $362,869 65 were from loans; expenditures, $975,991 61, of which $353,505 were to pay floating debt and bonds. The funded debt on Jan. 1, 1875, amounted to $3,600,140, on which the annual interest is $251,052 90. The principal charitable institutions are the poorhouse and hospital, an orphans' home, a dispensary, and an infirmary. The public schools of the city and of the county of Chatham are under the management of a board of education of 12 members. The schools for white and colored children are separate. In the year 1874-'5 there were in the city 6,919 children of school age (3,853 white and 3,066 colored), and 13 public schools (10 white and 3 colored), all graded, with 61 teachers; average daily attendance, 2,453. The white schools include two Catholic institutions. Outside of the city there were 13 ungraded schools (4 white and 9 colored). The expenditures during the year for all the schools amounted to $48,350 94, of which $42,-927 96 were for teachers' wages. The schools are free, being supported mainly by city and county appropriations. There are several private schools, and a medical college with 14 professors. Two daily (one German), one triweekly, and four weekly (one German) newspapers are published. There are 30 churches, viz. : 9 Baptist (7 colored), 1 Congregational (colored), 4 Episcopal (1 colored), 2 Jewish, 1 Lutheran, 4 Methodist (2 colored), 4 Presbyterian, 4 Roman Catholic, and 1 undenominational. - Savannah was founded in February, 1733, by Gen. Oglethorpe. The British attacked it on March 3, 1776, and were repulsed; but on Dec. 29, 1778, they took possession of the city. In October, 1779, the French and American army under Count D'Estaing and Gen. Lincoln attempted to recapture it, but were unsuccessful. In this engagement Count Pulaski fell, and the French lost 537 in killed and wounded, and the Americans 241. Savannah received a city charter in December, 1789. In November, 1796, a fire destroyed property to the value of $1,000,000; and in January, 1820, another conflagration occurred, involving a loss of $4,000,000. On Jan. 3, 1861, two weeks prior to the passage of the ordinance of secession by the convention of Georgia, Forts Jackson and Pulaski were seized by the state troops by order of the governor. During the war the place was occupied as a confederate military post and depot. It was the point on the sea to which Sherman's march from Atlanta was directed, and the first serious opposition which he encountered was about 15 m. N. W. of the city, the roads to which were obstructed by felled timber, earthworks, and artillery; but these obstructions were turned, and on Dec. 10, 1864, the city was fairly invested. The entrance of the Ogeechee river into Ossibaw sound was guarded by Fort McAllister, a work of no great strength, having 23 guns mounted en barbette, a mortar, and a garrison of about 200 men. This fort was captured Dec. 13, with a Union loss of 90 men, and on the 17th Gen. Hardee, who had about 10,000 men at Savannah, mostly militia, was summoned to surrender by Sherman. Hardee refused on the ground that he still maintained his line of defence, and was in communication with his superior officers. Sherman then prepared to assault, but before his arrangements were completed Hardee abandoned the city and retreated to Charleston. The Union army entered Savannah on Dec. 21. Among the captures were 25,000 bales of cotton. * Six months ending Jan. 1. † Year ending Jan. 1.